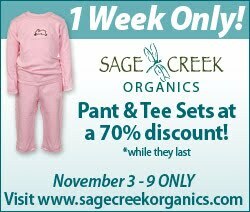 Pant and Tee Sets for Baby Girl, Baby Boy and Unisex at a 70% Discount! Discover the world of Sage Creek Organics! Pure, buttery soft 100% certified organic baby and toddler clothes for the discriminating consumer who wants only the best for their children. The price will be down to $11.70! Sage Creek Organics wanted me to share the news about this awesome sale with you…and I happily obliged because I’ve previously used some of their outfits (in fact, the same one that’s on sale! ), onesies, and washcloths–they’re fabulous! The clothing stays true to form regardless of washings, is super soft, and well crafted. Don’t miss out on your chance to grab up some of these outfits at a great rate!